PORTLAND, Ore. -- A Washington state wildlife spokesman says two salmon-eating California sea lions have been captured this week at Bonneville Dam and killed by lethal injection. The Oregonian reports the deaths are the first this year after a federal judge ruled last month the program could proceed. Washington Fish and Wildlife spokesman Craig Bartlett says the sea lions were captured Tuesday. 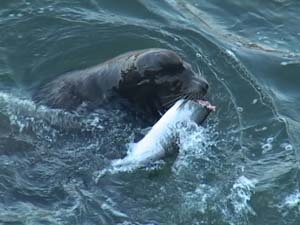 The killings are limited to California sea lions documented as targeting spring chinook or steelhead near Bonneville, the first dam the returning fish encounter on their run up the Columbia River. The sea lions also must return to the dam despite nonlethal hazing and be spotted nearby for at least five days, though the days can accumulate over several years. The Humane Society of the United States has filed suit in an effort to permanently end the sea lion killings.